Starred Review. Grade 3-5. In alternating chapters, two fourth graders tell about the development of their unlikely friendship. Drita is a refugee from Kosova who, along with her family, is finally joining her father in New York City. In a cramped apartment and without connections or language skills, her mother sinks into a serious depression, while the girl struggles to find her place in school. Maxie, a precocious African-American child who lives with her supportive grandmother and her widowed father, struggles, too; shes in constant trouble in school for her comedic efforts since her mother died. When she sees a news report on Kosova, she decides to do a project on Albanian refugees, focusing on Drita. The girls find common ground, and when Maxies grandmother, a retired nurse, sweeps in to rescue Drita's mother, the families forge a bond as well. Maxies attempts to help Drita understand American ways are touching, and Dritas understanding of her friends loss is a testament to the emotional intelligence of children. 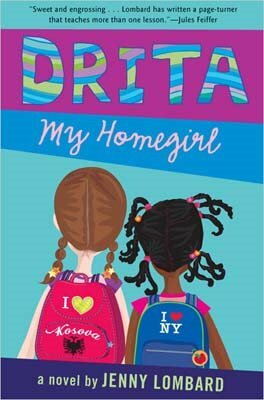 Drita's story resonates with the bravery of an individual determined to become part of her new country while retaining the love of her homeland. Maxie has the cocky voice of a girl who is trying too hard to disguise her pain. More a tale of the power of love than of refugees, this first novel is imbued with the language and customs of Kosova as well as the efforts of a family attempting to regain balance. Read it aloud to groups and let the conversations begin.–Susan Oliver, Tampa-Hillsborough Public Library System, FL Copyright © Reed Business Information, a division of Reed Elsevier Inc. All rights reserved.